If you have been with us since the beginning of the baby years, then you may know that we have always had trouble with J & sleep. N seems to be a bit better but we would like to nip it in the bud before he gets to J’s age and is still having sleep and bed time issues which is a nightmare to deal with every night with one child, let alone two. Both boys tend to usually get up between 6am & 7am though sometimes it is much earlier. We all know that an early day equals grumpy parents and grumpy children, especially if they have given up napping too like mine have. N goes to bed at 6.30pm and J goes at 7pm so he has that extra half an hour with full attention on him, as we did have jealousy issues when N was born (not that they have disappeared any!). We have tried pretty much everything with J over the last 3 years and barely anything has actually worked, so I was delighted for us to be able to review The Gro Clock from The Gro Company as I have heard good things about them. We already have a Gro Egg bedroom thermometer so we know that they are quality products, but did it work with going to bed and getting up? The Gro Clock has a few functions; it is a night light, an hourly count down timer, and it can even be used as an alarm. 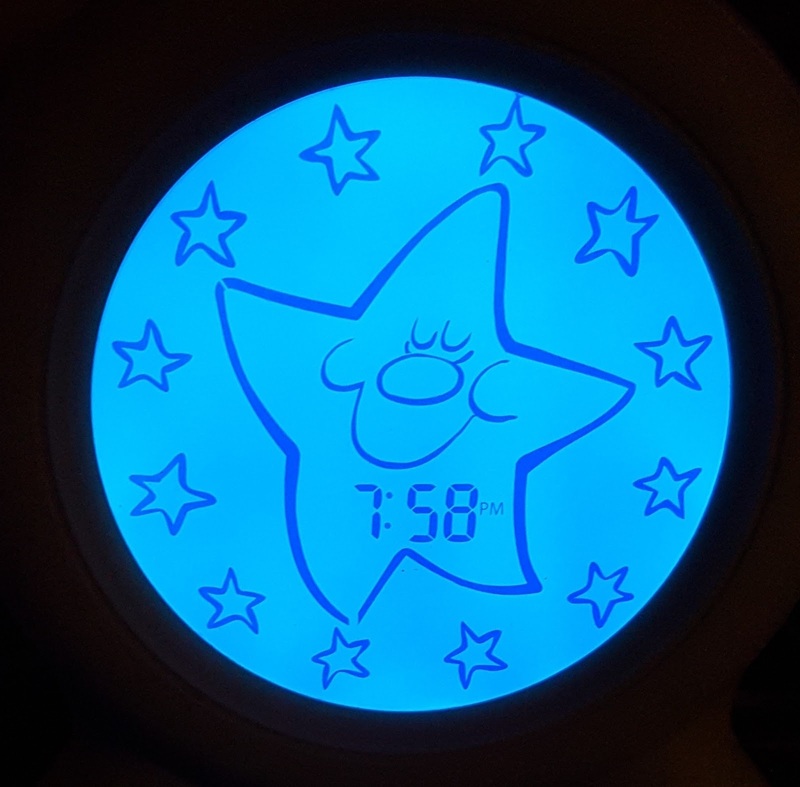 When the child goes to bed the clock turns blue and a star face appears to indicate that it’s night time, and gradually the stars around the edge disappear, indicating the hours and counting down to morning time when the clock turns orange and the sun face appears again, meaning it’s time to get up. You can set the clock to your own bed times and get up times so it is personal to your child, and then you can also set it to come on automatic or you can do it manually with your child. 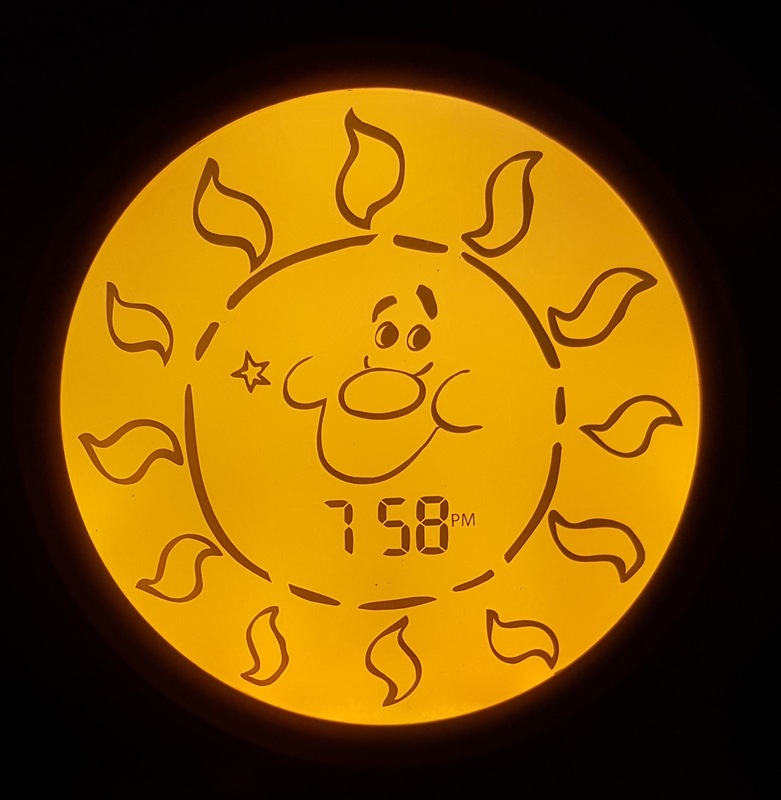 We chose to do it manually as J likes to say goodnight to the face on the clock – I like this feature as it is friendly for the child and they can relate to it like J does. It did take me a few times to get used to selecting the different functions, but it’s easy to remember now. 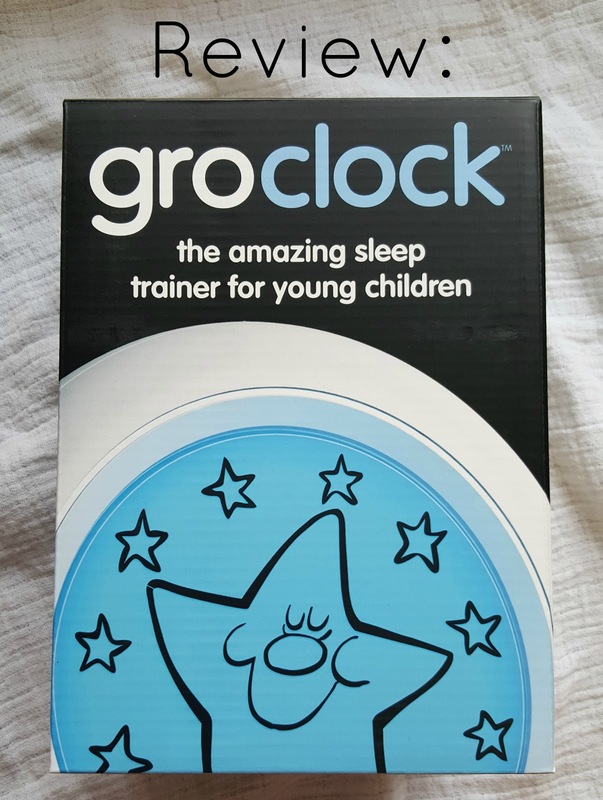 The Gro Clock also comes with a small story book about a pig who slept all day meaning he went to bed late and was grumpy all day, so his friends bought him a special clock. Yes, you guessed it – a Gro Clock! This is a great addition to be able to read at bed time, so again the child can relate to it. Sharing a room – an update! You may have read last month that we were making preparations to move the boys into the same bedroom. Our main reason for this was – and maybe it was a bit selfish on our part – that we wanted our bedroom back! After having a child in there for nearly three years (in a cot, and then a co-sleeping toddler until N was born) we just wanted ‘our’ bit of space back. It meant us giving up the biggest bedroom but that was a fair sacrifice to make! When the day came, my brother-in-law came to help with the swapping furniture around and after umm-ing and ahh-ing about where it should all go in its new place, it was all done & dusted after two or three hours. After totally emptying my huge free standing wardrobe in order to move rooms, I couldn’t be bothered with swapping the stuff around from the built in ones so hubby’s stuff was still in the boys’ bedroom for a while, and J’s in ours – in fact, the boys’ hats and gloves are still in what is now hubby’s wardrobe! (You know how it goes, ask a man to do something (hammer a few nails in) and they’ll do it…eventually! I may as well just do it myself, actually…). The first night of them being in the same room I was absolutely dreading as N goes to bed half an hour earlier than J at the minute (so J gets some time with us just to himself) and J isn’t the quietest at bed time so I was expecting J to wake him up. It actually went quite smoothly. J did make a little bit of noise at first but when I whispered a couple of times that N was asleep, he quietened down. He’s been pretty good about it, other than the occasional time when he’s in one of those moods where he just wants to annoy everyone! It so happens that when N is asleep he’s actually quite a heavy sleeper so he hasn’t managed to wake him up – thank goodness, as he’s an absolute nightmare to get back to sleep. Another thing I was unsure about was one waking the other up in the middle of the night as they both do still wake up occasionally. I was expecting it to be N waking up in all honesty, but the first few nights he slept through until morning and it was J who woke up! When he was in a room on his own he had a baby gate on his door (which has now moved to the shared room) and when he awoke in the night he would stand there shouting mummy or daddy – I didn’t want that to wake N up so decided to just leave the handle up a little as he could then open it and just come in our room. It wouldn’t be the first time that we had woken up to find him in bed with us – in fact once before he came in our room and was stood by the bed as I woke up, he scared me half to death! Obviously with N still being in his cot he can’t just get out so moans or cries when he wakes up, but that hasn’t managed to wake J up either. A few weeks ago we made the decision to convert little man’s cot bed into a bed (though we have only taken one side off as he will be getting a full size single when baby needs this). He hadn’t started climbing out, but we were having issues with him going to bed and his bedtime and wanted to get him into some kind of routine before baby arrives. Although if he has nap, especially late in the afternoon falling asleep in the car or something, he just will not go to sleep early no matter what! He doesn’t usually nap though, he hasn’t done since just after he turned 1. Our usual routine went like this – there was none! He was such a nightmare to get to bed on his own and would usually go to bed when we went and then co-sleep with us all night. Anyone who knows me knows I love co-sleeping but it was just getting too uncomfortable for me and I couldn’t actually sleep at all. If he did go in his own bed, it would be after falling asleep on either of us with his bottle. And sometimes that didn’t even work because as soon as you put him down (having to lower him down) he would most likely wake straight up and then not go back to sleep, so he would just end up in with us anyway. So the reason we converted his cot bed into a bed, was so that it might feel a bit more like ours and he would go to sleep in it and stay in it a bit longer – if not all night. To add to the big bed ‘feel’ we also bought him a proper duvet and a pillow. For the first 3 nights, he still had his bottle with us, and then we would put him in his bed, but it was easier because we could just slide him in. He slept in there ALL night! And then he got ill. So he started coming in with us again as it was just easier. When he was better, we decided that giving him his bottle in bed might be easier – if he fell asleep with it, that is. One of us sat with him though as I think he prefers someone to be there. Ever since then he has gone to sleep in his own bed. At a reasonable time too – between 7pm & 8pm. I cannot actually remember the last time this happened. Sometimes though, he does still wake in the night and I wake up to find him in our bed – I must get a gate on his door! But I am just so glad now that he has a proper bedtime routine, as this is what was stressing me out and upsetting me the most. As well as him being incredibly grumpy because he was so obviously tired, I would often be in tears as we never got any downtime to relax or time to ourselves in the evening, but now we do, almost every night. Thanks, little man. (Please keep it up! ).